← Parking Tracker – Love it!! You know I prefer travelling by my car. I use it as much as possible. I said, as much as possible. Why? 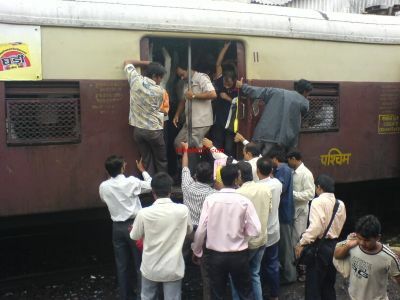 Because, in Mumbai, you just can’t do without the Local trains, popularly called the Mumbai Locals! I know about the AC buses and I know, they are hell lot more comfortable but the Locals have one advantage that no public transport in this city can offer. Time. The locals save time. Imagine, I am in Powai at 10 in the morning. I have a meeting in Fort at 12 and another in Mulund at 3. There is no way I can attend both the meetings if I don’t take a train from Kanjurmarg Station to CST and from CST to Mulund directly or to Kanjurmarg and pick my car from Powai and go to Mulund. You see, they have become a necessary evil in my life. Ha ha! Why do I call it evil? It’s dangerous. It’s crowded, easy target for some rogue neighbourly citizens and it messes my shirt in getting in or getting out depending on the crowd. Yes, even if you have a First Class pass! Given the choice, I will always prefer roads to tracks. They are under my control. But as I said, the Mumbai Locals are an absolute must for anyone living in Mumbai. I wonder how many millions of commuters use it everyday! If there’s any classic public transport example for a metro in India, it’s the Mumbai Locals. The platforms have pillars marked to make you know where the First Class bogies will stop. The service is so frequent that it’s not funny, it’s a serious business. The geography of Mumbai infact helps it. It’s a city in a rectangular shape so you run two (ok, harbour is also there) lines and almost all the city is covered by the railway tracks. Nothing’s more than 5 kms away (that’s a metaphor, it can be 10 also, 15 also depending on where you are and how hell-bent you are on proving that 5 kms from any station, wrong 😉 ) ! I love it for the time it saves for me. One megablock for one line for some maintenance and see the chaos on roads! Ok, in 0-20, I will also use cabs and autos depending on where I am going and what’s the parking scenario of that locality! 4 Responses to The Mumbai Locals!! Hope Mumbai Metro will be better. It is Mumbai. what do you expect. lol! no seriously, Mumbai Locals are a fantastic way to cover the city if you require to do so as per job demands. I am just trying to bring a balance, in how much madness can I allow while travelling, in my daily life. ha ha! How have you been? absolutely gaayab!